Is there a way to move that little red window showing the axis when you hit ctrl+enter)? MOBO ASUS P5QL-Pro, Intel Q9550 2.8Ghz @ 3.5 GHZ, 8GB DDR2 Crucial, XFX HD6950, TM Warthog, TIR4 /w Pro-Clip, 24 In Samsung Syncmaster LED, 2 X Cheapo 8in LCD's for MFD's and TM MFCD's attached to it, Windows 7 Ultimate x64. Thank you for the reply PeterP. Found the files that defines the Controller indicator but didn't played around with the values - as I have no problem with the the current position (Means:I don't have to use it because I use a FFB controller and I always know how much trim I have applied.) - but you can have a try. OK, Pitbull- You are a lucky guy! - I had a some time on my hands for a deeper look - and I found the right triggers that are responsible for the placement of the control indicator in the cockpit-view. I made some quick testing and instead of posting lots of pictures that show nearly the same; I copied each different position into the same screen. I made notes which values are used for each position. Now you should know enough how to create your own desired spawn point of the CTRL-Indicator. (...Up to now I not fully aware what exact logic triggers the spawn-point. But up to now I can say that when moving the indicator (size 0.15) from x0 to x1 -it will equal 384 pixels and all values are bound to the centre of the XYjoystick position cross.). First set the wished Size - and than place it where you want it. 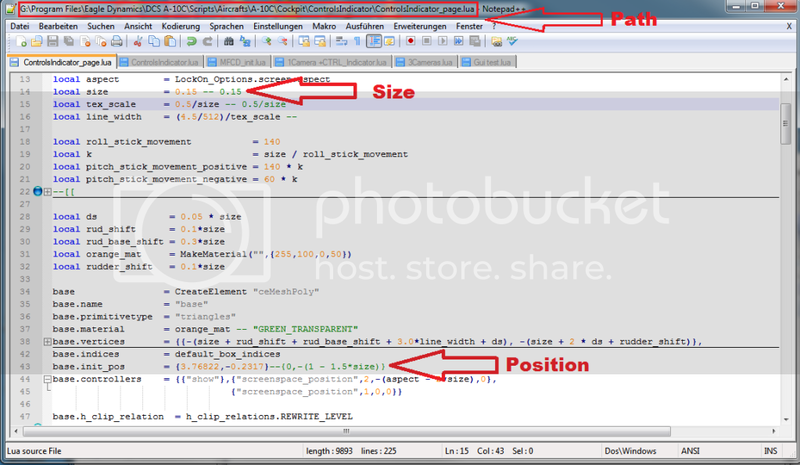 - Because resizing it will change the relative position again , and you have to start over again. Last edited by PeterP; 03-24-2012 at 07:15 AM. Thanks again PeterP, I will try your suggestions as soon as i can. thank you, +1rep for that Peter. edit: will not let me rep you. in the pic (well done) you refer to "line 34"
Last edited by LiveBait; 03-24-2012 at 03:51 AM. This works fine in the current version of World. WHERE CAN I DO THIS in 1.2.7?